The Social Christmas Market is back with Cold War Steve, Rough Trade Books, Heavenly, Faber Social and lots more! A time honoured tradition here on Little Portland St. Stalls from all your favourite people full of brilliant presents, special beers, mulled wine, music, mince pies and really nice people. Special guest stalls include Rough Trade Books, Cold War Steve, Heavenly, Faber Social, Caught by the River, Andrew of Arcadia, Suna Socks, Justin Robertson, Tartaruga, So Young, Remainiacs, Daisy and Esme Shayler-Webb and lots more! 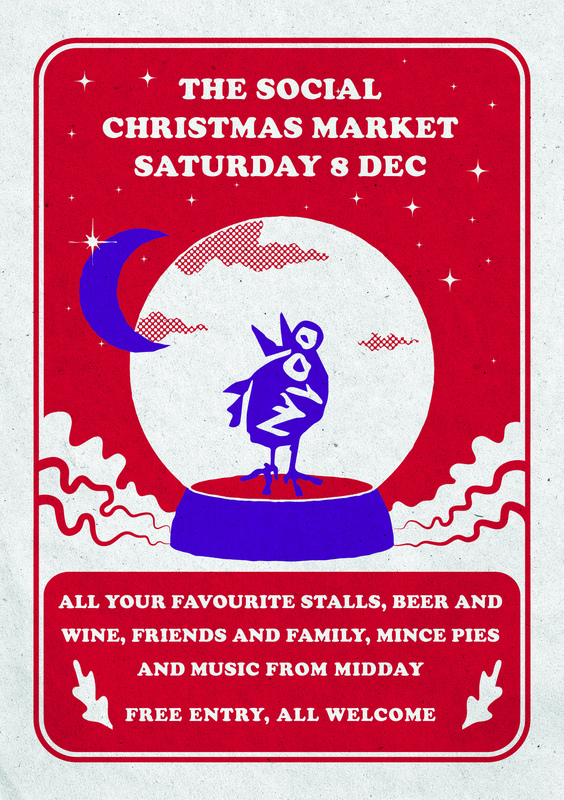 This year the market takes place on Saturday 8 Dec from midday sharp until about 1730. The bar and kitchen will be knocking out bloody marys, mulled wine, special beers from Camden Town Brewery and the ‘perfect cheeseburger’ (London in Stereo) all day long. We’ll have both floors open for extra space, stalls up and down and live music in the basement mid afternoon.